You never know when you’re going to need a relatively quick and simple appetizer for entertaining that looks like you’ve spent hours preparing! Crostini to the rescue! I like to teach students that party foods don’t have to be super difficult, expensive or time consuming to pull together. 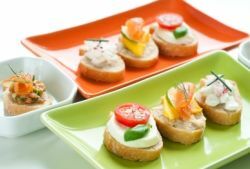 The self-directed mini-lesson provides some background information about crostini and how to make them and then students get to pretend they have to pull together a few crostini appetizers for entertaining, using ingredients they have on hand. The creative possibilities are endless! As a tasty finale, students prepare and sample some hot and cold crostini in the lab! Yum! An impromptu get together with friends leaves you wondering what you can serve that will be visually appealing, tasty, inexpensive and easy to prepare in a short amount of time. Brainstorm a list of food ideas you could prepare that meet the aforementioned criteria. Share ideas and hopefully someone will suggest appetizers, opening the door for you to introduce crostini. Note: If your school is not 1:1, use the PowerPoint to teach about crostini. It includes links to all of the resources used in the QR Codes. If your school is 1:1, the self-directed activities are as follows. To learn more about crostini, students will scan the QR Code linking them to an article they will read and use to answer questions. The article is Your Guide to Party-Perfect Crostini and the questions are in the attachments below. Next students will learn how to make Homemade Crostini, again answering a few questions. Finally, to show how a few ingredients can yield a variety of different crostini, have students watch the YouTube video titled “5 Ingredient Crostini, 5 Ways” and complete the assignment that corresponds with it. Once students understand how easy and versatile crostini appetizers are to make, we head to the lab to make 3 different types of hot and cold crostini. I have found the crostini recipes from Betty Crocker are easy, delicious and many work for my class time length as well as the skill level of my introductory level students. I give students a list to choose from and each group selects the crostini recipe they wish to make, but the whole class gets to sample each groups final product. As a final activity or project, I have my students create (on paper) 4 unique Crositni Creations using a provided toppings list of common, inexpensive foods. The baguette is their base for the purpose of this assignment. Students must name, describe and colorfully illustrate their Crostini Creations, using at least 3 different ingredients. For bonus points, they can prepare one of their crostini creations at home and bring it in for the class to sample.